Ideal wrinkle reduction is achieved by replenishing your skin’s lost volume. Upon injection, RADIESSE® Volumizing Filler immediately provides the volume and lift needed to diminish the signs of aging because of the calcium-based microspheres and gel that comprise the product. But what’s unique about RADIESSE® Volumizing Filler is that it acts as a scaffold under the skin, providing structure and stimulating your own natural collagen to grow. This process continues for several months, which extends the initial effect of RADIESSE® Volumizing Filler. Best of all, the natural results are clinically proven to last a year or more in many patients, which is why more and more cosmetic surgeons, dermatologists and other medical professionals are choosing RADIESSE® Volumizing Filler to achieve long-lasting facial rejuvenation. Why choose RADIESSE® Volumizing Filler? It is the only filler that immediately replenishes lost volume and stimulates the production of your own natural collagen for long-lasting results. It is clinically proven to last a year or more in many patients. RADIESSE® patients are significantly more satisfied than patients treated with other leading wrinkle fillers. It is FDA approved to mix with lidocaine to significantly reduce injection related pain. Treatment with RADIESSE Volumizing Filler is quick, comfortable and convenient, with immediately visible, long-lasting results. Experience what millions worldwide have and begin your journey toward a natural, more refreshed you today. RADIESSE® Volumizing Filler is FDA-approved for subdermal implantation for the correction of moderate to severe facial wrinkles and folds, such as nasolabial folds. After injection, patients may experience redness, bruising, swelling or other local side effects. Most side effects of treatment resolve within a few days. Rarer side effects may include swelling that lasts longer, unevenness or firmness in the area injected and as with any injection, there may be a risk of infection. Ask your doctor about BOTOX® Cosmetic to find out if it is right for you. BOTOX® Cosmetic is a prescription medicine that is injected into muscles and used to improve the look of moderate-to-severe frown lines between the brows in people 18 to 65 years of age for a short period of time (temporary). BOTOX® Cosmetic, introduced in 2002, is the first botulinum toxin to be approved by the FDA to temporarily treat moderate to severe glabellar lines between the brows. With real, noticeable results, no surgery and no recovery time, there are many reasons why BOTOX® Cosmetic has been chosen by millions of women and their doctors. 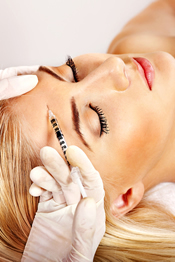 Approximately 11.8 million BOTOX® Cosmetic procedures have been administered in the United States since 2002. 92 percent of 303 patients surveyed were satisfied with the results of their BOTOX® Cosmetic experience. Aging skin and wrinkles result from a combination of many factors. It’s not just about cellular changes, collagen depletion, hormone loss or damage caused by free radicals. The 11s – those vertical lines that appear between your brows – result from muscle contractions. When you concentrate, squint or frown, the muscles between your brows contract, causing your skin to furrow and fold. After years of frequent contraction, those wrinkles can linger even after the muscles are at rest. BOTOX® Cosmetic works by blocking nerve impulses to the injected muscles. This reduces muscle activity that causes the persistent lines to form between the brows.